A few months ago, a member of my entrepreneur group asked us if we’d be willing to help out with a project she was putting together. It was a way to give back and to raise awareness for depression and suicide by creating a book – revealing our own experiences with changing directions, dealing with doubts and fears and depression. I had agreed to donate a chapter, but then life happened, and I didn’t get to sit down and write that chapter. Part of the reason was things suddenly got busy, but also, at the time I just didn’t feel I had anything worth saying. I hadn’t had any real success with my new business venture – in fact, I hadn’t even gotten it off the ground yet! But the project’s coordinator was kind, and allowed me to continue to be a part of the project by giving her permission to include one of my art pieces in the book. So I’m putting this article out there for everyone to read. This is my story, my pain, my struggle. This is my life, living one day at a time, occasionally wondering if it’s worth it, but never willing to give up. I like to say that as someone born under the sign of Taurus, AND in the Year of the Goat, I have a double dose of stubborn. I also have an artist’s soul. There are enough moments in life that take my breathe away, and remembering that helps me get through the bad times. I look at the beautiful designs other artists create, and the gorgeous ways people are coloring those designs, and it reminds me that there are still things in this world that I want to see. There are still things that will make me stop and stare and wonder. There are poems to read, masterpieces to admire, sculptures to touch, and nature’s ever-changing landscape of beauty to inspire. The basic premise of the project is to tell our story, to let people know that they are not alone, to TALK about this “silent killer” that has such a stigma attached to it that even to speak of it within a family seems to be forbidden. We hope to give a voice to those who no longer have a voice, and to give a hopeful message to those who may need to hear it. If you wish to read the book, it’s called The Save A Life Send An Email Project, and is available as an ebook on Amazon. Here’s the thing. I have a chronic illness. I developed fibromyalgia following surgery to remove my gall bladder over 15 years ago. Back then, fibromyalgia still contained a stigma of “it’s all in your head,” to the point that my doctor treated me and prescribed medications to help me, but wouldn’t list it in my chart because she said other doctors would label me a hypochondriac. Of course, now it is a well-recognized illness, and they’re even starting to find some interesting things in research studies that may explain what causes it. But for over 15 years, I’ve had to deal with a condition that causes, as the commercial says, “chronic widespread pain.” People who don’t have a chronic condition can’t really understand what it is like to live with pain every single day; to go to bed not knowing if you’re going to wake up in so much pain that you can’t get out of bed; to flinching at the lightest touch because your body decides to tell you someone just placed a red hot poker against your arm. We go through life telling people what they expect to hear when they ask how we’re doing, because no one really wants to hear that you’re in pain today, but it’s not a bad day like yesterday when all you wanted to do was curl up in bed and cry because the pain was so bad. I take various medications to help me sleep, to help relax my muscles which tend to seize up as I try to live a normal life, and a strong pain medication to help me get through the worst days. And yes, one of the medications I take every day is an anti-depressant. But the reason I’m posting this here on my coloring site is because for me, art therapy is even more important than all the pills in the world. I’ve done various different arts and crafts over the years – beading, knitting, crochet, and most recently, of course, drawing and coloring. Working on my art takes me out of myself , and takes me to a place where the pain is far away and the only thing in my mind is the next pencil stroke or the next color choice. A good coloring session leaves me feeling lighter, makes the burden seem less overwhelming, and puts a smile on my face (or at least takes away the frown!) Even the pain seems to take a back seat to the joy I get from creating. When I was laid off from my job last year, I decided to see if I could create a business where I could set my own hours; where I could work when I had the energy without feeling guilty if I had to take a day or two off to deal with a flare-up. I decided to try to build a business around my artwork. Originally, I was trying to sell my finished art. But I was drawn to creating my own drawings through coloring books, and I still felt a kinship with that. So I started looking at what I could do in the world of adult coloring books. This site was the end result of several months of doing internet searches on how to publish coloring books, trying to find places that discussed the merits of books for a more advanced coloring enthusiast, and wondering what I could contribute to this growing niche. A series of happy coincidences also led me to start up a Facebook group to go with the site, and that experience has been the tinder that really lit a fire under my ideas. The people in my group are so amazing – many of them also suffer from various chronic conditions. Like me, they use coloring as a way to cope with the pain or stigma associated with their conditions. Like me, they have a zest for life that won’t be crushed. They share of themselves freely, and their generosity, their humor, and their beautiful colorings are guaranteed to bring a smile to my face. So there’s my story. Yes, there is pain. Yes, there is depression. Yes, thoughts of suicide have floated through my brain during the worst of the bad days. No, I don’t think that being depressed or having thoughts of suicide makes you a bad person. No I don’t think that it is right that our society has a stigma attached to these feelings – that somehow (without the words ever being said) we’re taught that to speak of depression or suicide is Just Not Done. 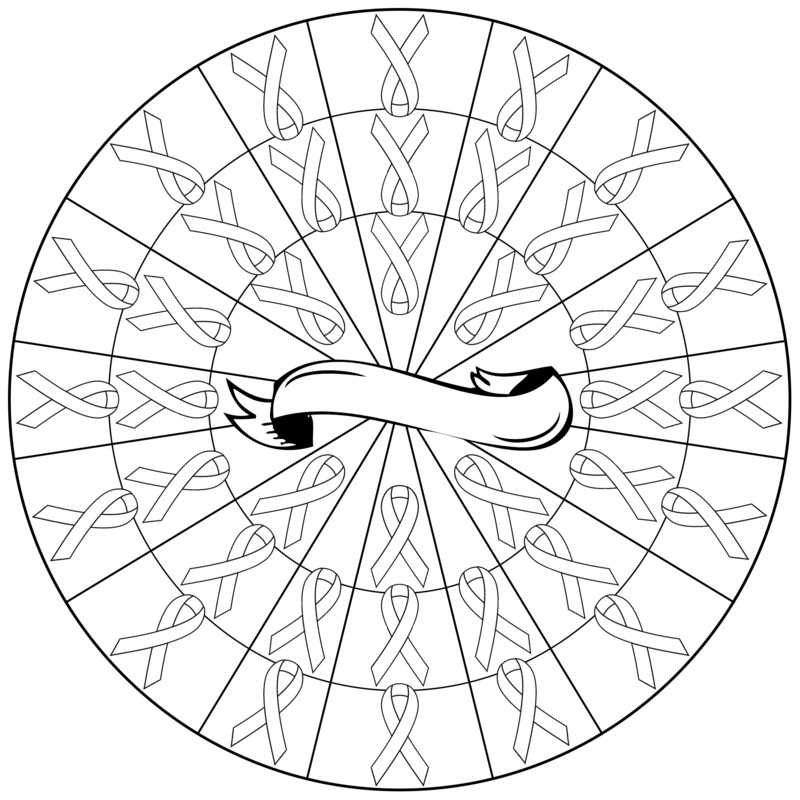 And because this is, after all, a coloring site, here’s a free awareness ribbon mandala for you to enjoy. Color it with the yellow of Suicide Prevention Awareness, or color it with the green of Depression Awareness (or both! 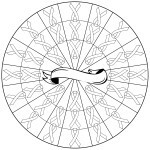 ), or color it with the colors of your own chronic condition or illness. Share it freely with friends or family, or print it out to use in your own efforts to raise awareness or promote ending the stigma. This design will always be free, and will be included as the last design in every coloring book I publish.